The resources & tools I love and use to grow my business every day. You need tools that help you grow your business WITHOUT wasting time. That's because you’re in the business of serving your clients & students, not spending countless hours learning complex tools! But there are SO many tools out there. Which ones to choose? I’ve tried so many of them… If the tool was hard to learn or use, you can bet it didn’t make my favorite list! I don’t mind paying more if it means the tool will make my life easier and save me time. Because you know… time is money. I know it’s a cliché, but it’s nonetheless true! I refuse to work with complex, poorly designed tools only to save a few bucks a month. I'd rather spend my time growing my business instead. It's a much better return on my time & money investment. Without due, here are my favorite tools & resources. Some of these links are affiliate links, which means I may earn a commission if you choose to make a purchase. This comes at no additional cost to you. I only recommend products I use and LOVE. For more details, read the disclosure. Download this free roadmap and get 5 EASY steps (in the right order) that will set your Pinterest account up for success! Want to connect with other coaches, service providers and course creators - just like you - that are ready to grow their businesses using Pinterest? Sweet! I've got just the thing for you! Join my free Facebook group. See you inside! The rules for creating pins that get clicks have changed. You need a cheat sheet NOW. Download this free cheat sheet and find out the 4 crucial things you need on your graphics that will make people CLICK. It's one of the very few schedulers approved by Pinterest and I absolutely love using it. It saves me loads of time and provides invaluable insights in my results. Find out more about how I use Tailwind to grow my traffic. You can try Tailwind for free by clicking here. 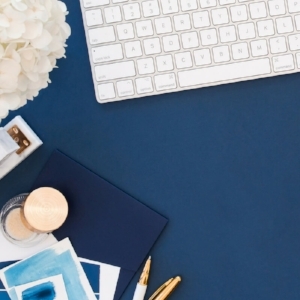 Absolutely gorgeous stock photography for female entrepreneurs. I have changed the vast majority of the images on my site to be from Haute Stock. I find it helps me stand out online by bringing uniqueness and elegance to my brand. Something I was not able to achieve with free stock photography (since you see the same images repeated over and over again creating a sea of sameness). And standing out online is something definitely worth investing in! Growing an email list is a priority. As they say "the money is in the list"! As long as you're building an engaged list, that is. ConvertKit is great for automating email campaigns, delivering lead magnets and sending sales sequences. I like it because it has strong delivery rates and it's really easy to use. It's perfect for creating engaging live videos. You can highlight comments from your live audience, display your screen + yourself at the same time (ie. picture-in-picture), add overlays for a professional look, add a countdown timer, easily switch between a live of you and sharing your screen. Note that it works with Mac only. This tool is intuitive and makes it easy to go live with a professional look. For easy and efficient scheduling of client calls without any of the back and forth. My clients can easily look up my availability and book me for services. Acuity automatically manages questionnaires and appointment reminders - saving my clients and I precious time. The tool also accepts payments. If your site is on Squarespace, you can get the Acuity Emerging Entrepreneur package for free - and that's always nice. Otherwise, the other options are affordable. For beautiful graphics, fonts, stock photography and more. There's so much choice available, I bet you'll find something that fits your brand and style. One word of caution: before purchasing, make sure to read and select the license that fits your needs. When signing up for a free account, you also get 6 free design assets each week. Sweet! It's the only tool I have opened at all times. I use Asana to organize & prioritize my tasks. It helps me stay on top of everything I'm working on. I like creating templates to help me save time so I don't have to reinvent the wheel each week. I have templates for content creation, social media management including with my Facebook group, course promotion, etc. If I do something more than once, you can bet that I have a template for it! What does performance have to do with meditation? Try it and you'll see! I've personally experienced how a calm mind is a focused and productive one. Most day, I'll do a meditation and put "focus" music on to help me become hyper-concentrated on my work. I love this app so much that I got you a 25% discount on a yearly subscription. If you prefer, you can also try it first for free by going to their homepage. I'm NOT getting any commissions or kickbacks from this - I just really believe in the power of meditation and focus music to 10x performance. And I want to share this gift with you. The app also integrates with my browser to catch typos on the go. And the basic account is free, so no excuse to not get it!